In a prior post, we spoke of pending Annual Operating Plan (AOP) goals being created and prepared for the coming year. As Sales Leaders prepare to receive their new targets, understanding what “levers you can pull” as areas of focus are key to hitting this target. Where are you going to extract the growth from? As those thoughts are pondered, an area of focus close to the sales leader is to do more with what you have. How do you make your sales force more effective in their daily tasks? This sounds overly simple but we all know that’s not true. How do I get Salesman A and Salesman B to grow their sales bookings by +10%? Can I repeat those fantastic “elephants” or “blue birds” that we landed this year? One area of focus is to provide training to your current sales force. Making your sales people more effective each and every day is the target. Sales are the reason for which businesses exist. If we draw a micro view of the sale effort against actual sales, then it initially increases as the sales efforts are increased. A sales effort is a function of the sales force, processes followed and toolset at their disposal. 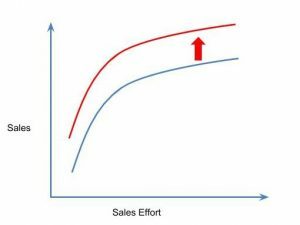 However, the sales vs sales effort gives a reduced marginal rate of sales increase with increasing sales effort. This is the nature of things, and any effort in this direction will provide marginal improvements only. None of us want to think or admit that in many cases, the actual sales numbers are a function of the macro environment which a firm has very little control. The graph needs to be shifted. 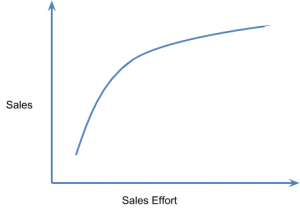 As various economic theories on growth show, one of the major reason for such shifts happens by technological advancements, which increases the productivity of the individuals. If we place the concept in the context of sales, then one of the important enablers in this is to leverage better tools. Tools that can help in discovering lost prospects. Tools that can help in finding opportunities to cross-sell and up-sell. Tools that can extract valuable information from massive amounts of data. Tools that can help in generating better sales numbers. Entytle can help by providing such a toolset at the fingertip of your sales force. By reviewing and analyzing multiple data sources, a more effective tool is presented to your sales team and actionable outcomes are delivered. By investing in this digitization of mounds of valuable information, you can shift your sales curve and help make your sales force more effective. You’ll find that giving this toolset to your sales force will make them more effective. Further, by investing in uncovering ways in which you make “your customers good day your good day” then you will be one step closer to hitting that new target for the coming year…!